Before I had ever visited India or knew much about the culture or people, one thing that always came to my mind when I thought of the country were weddings. To be honest, growing up in Germany, India felt like an exotic country far far away and I didn't really know anyone who had ever been. It might come as a surprise to any British readers that finding Indian restaurants in Germany isn't actually that easy so not even the cuisine is something that I was familiar with. One thing that I had heard about though and at least I thought I could picture in my mind were Indian weddings... Thousands of people, bright colours, lots of food and dancing to Indian music. They just sounded so different to any wedding I had ever been to that it was something that fascinated me (and trust me, I'm not usually fascinated by weddings and everything that comes with them). By the time we decided to move to India, I had been on holiday there, I had tried my fair share of curries (both British Indian and real Indian), had read various books about this history of the country and worked with Indians. As a result, I had also heard many first hand stories of Indian weddings and have to say I was hoping that sometime during our stay in India, we would get the chance to attend and Indian wedding ourselves. Little did I know that we would end up having a wedding invitations before the visa. On a pre-visit to Mumbai, we met my old boss (who is from Mumbai) for dinner and I happened to mention that it would be cool to attend an Indian wedding at some point and without any hesitation he invited us to his cousin sister's wedding in 2 months time (just imagine you just deciding to invite two absolute strangers to your cousin's wedding - she would be thrilled wouldn't she?!). Such a kind invite and we were very excited but also not sure what to expect. As we settled into life in Mumbai, the date of the wedding came closer and closer with neither Indiadam or myself with a clue about how to prepare. What should we wear, what do you do as wedding gifts, what are do's and dont's? Luckily, one of my old colleagues from London is from a Mumbai family and she gave me lots of useful tips on whatsapp on what to wear and where to shop. With the wedding on a Monday, Indiadam and I set off on Saturday to get ourselves outfit ready for a proper Indian wedding. First mistake - when we walked into the Sari shop and told the helpful staff that I needed a Sari and a dress for Monday they looked at us in panic: "not enough time". For what I think? Tailoring the blouse and dress apparently... Ok, so we better get started. Walking into a Sari shop during wedding season is pretty mind blowing - cloth and colours everywhere, staff (weirdly all male) helping customer try on one Sari after another and the constant noise of shouting for the tailor, another sample etc. Next: dress for the evening - and again, the choice was overwhelming with a different guy spreading about 30 dresses of various cuts and sizes in front of me. Being a bit tired of trying on clothes, I saw a purple one liked, tried it on and went with it. The dress came with a beautifully stitched "scarf" that you wear over one shoulder but it goes all the way to your feet on both sides - not the easiest thing to wear but very pretty. Leaving the blouse and dress to be fitted, we were told we could pick them up at 7pm the next day, Sunday. Just in time for the wedding on Monday morning. Last but not least, we needed an outfit for Indiadam. A kurta pyjama which I was really looking forward to seeing him wear. We got recommended a nice place called "Telon" in Santracruz which was very good but also very plush. A kurta pyjama basically consists of leggings and then a long pyjama looking overtop the length of a dress. Indiadam went with a dark red one, not knowing this would colour clash quite a lot with the turban he would be made to wear at the wedding - still a great look! Before we could get started though, I had to get dressed. 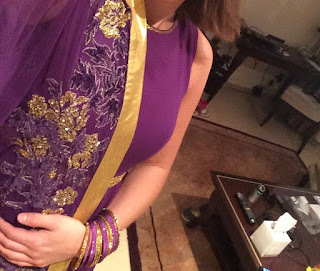 Putting a Sari on is actually very difficult and requires a lot of skill and practice and although Indiadam kindly offered to learn from a Youtube video, I didn't trust him to make it secure enough that it would actually hold all day (which is quite important if it is the main thing you are wearing). So when I arrived and asked for help, three women immediately ushered me to a room to dress me properly. After lots of adjusting with the help of many safety pins I was ready to go. The preparation for the ceremony was quite relaxed, we met the groom and the bride who showed us the incredible henna she had gotten done on her arms and legs and explained the stories they were telling. Her jewelry and outfit was just amazing and she just looked stunning. The outfit is so different to the traditional white dress but just as beautiful (if not better). At some point during the preparations, Indiadam got instructed to follow the other men "to get turban done". I didn't see him for about an hour and when he came back he came in a parade of dancing men, trumpets and pink turbans - quite a sight and sound! The day was a combination of various traditions and ceremonies, some of them with quite a nice and playful touch. At some point for example the groom pretends to leave the wedding just to have to be convinced by the family to come back again. Or for the exchange of the garlands, the couple stand opposite of each other with a barrier (like a white piece of cloth) between then that they have to be lifted up over to exchange their garlands. The main part of the ceremony happens when the couple walks around the fire which seals the marriage. There are so many other parts I could describe in much more colourful detail but it might bore you a bit (and I have to admit I don't understand the meaning of a lot of rituals enough to do them justice). Worth noting is that the band plays/sings live in the background a lot of the day and the ceremony gets interrupted from time to time by impromptu dance sessions. The bride changed from one amazing outfit into another and got carried through the room in this - how cool is that?! There were also some parts obviously that for us Europeans seem a bit weird, for example the part where the "ownership" of the girl passes from the parents to the husband or the fact that the bride's parents aren't present for some part of the ceremony... What I did admire though is the dedication and importance given to the rituals - so many people in Europe get married in a church and white dress because they like the idea rather than the meaning while the respect for tradition and the importance of the event can be felt in every detail of an Indian wedding. Finishing the evening off with a few fireworks was a great end to our first Indian wedding. It truly was a special experience so if you ever get invited to an Indian wedding, make sure you go. And even if you barely know anyone, people are so inviting and friendly that you will no doubt have an amazing time. Just make sure you don't kiss the bride. Powai - home of the crocodile hunter?